Behind the old village hall is the ruins of the first Methodist Church. Still standing, the building is, presently, two apartments. Earlier in the 1900’s this building served the community of Brooklyn in many ways. Here, Brooklyn’s first fire station was housed. Brooklyn suffered destruction of fires in the early years. In 1882, the big elevator burned, holding the farmer’s grain. In the early morning of November 1893, a fire broke out in Jensen’s kitchen on Hotel Street; its flames reached the Opera House and Hickman’s Barber Shop. A large supply of clothing stored by Olson & Veerhersen of Madison was destroyed in the Opera House. Luckily, the Opera House owners, (parties from Albany) had insured their building. During the hot parched summer of 1855, another huge fire wiped the downtown area. The wind easily speeded pieces of burning wood to neighboring buildings. All of the above fires caused terrific financial losses for the merchants and property owners. If the train passed during these fire wars, the conductor would ask the neighboring fire departments for assistance. Methods of distinguishing these devastating fires was drawing water from private wells and forming bucket brigades. Our founding fathers began to look for solutions. The ground floor housed the fire truck. Upstairs, the meetings were held. Atop the building was a cubicle. Enclosed was a 990-pound steel alloy bell that was rung by a strong rope pulley from below to alert the firemen of a fire. The bell was ordered from the C.S. Bell Company in Hillsboro, Ohio and was delivered to Brooklyn by the train. Time progressed with more space needed; a new fire station was built in 1967, two blocks south. No longer needed, the bell was sold and dismounted in 1972 at an auction; the sealed bid was rewarded to Hugh Dega. A more-modern siren system was being used. Realizing the importance of their loss, the fire department made several attempts over the years to have the firemen’s bell returned. Understanding the importance of the loss, the current owner, Richard Dewey donated the historic bell to the fire department in 1995. It’s seen, today, at the new fire station on West Main Street; built in 2007. When the school at the park burned down in 1907, the children came upstairs to the old village hall for their lessons until a new school could be constructed. A main project of Brooklyn’s Twentieth Century Club was incorporating a library in 1934. Books were donated and contributions of money were given from individuals and adjoining schools. The first librarian, Elna Karmgard Mortensen was paid 20-cents an hour. 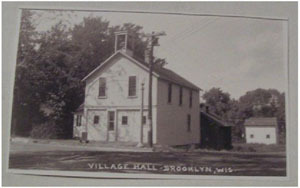 Shortly after the library was started, it was moved from the old village hall to the community hall on the northwest side. In 1949, the club reported there were 5,000 books and seven magazine subscriptions. The library was closed in May-1979.